SAN FRANCISCO -- For the connected, automated cars of the future, choosing the right silicon may be as important as choosing the right steel. That's the thinking behind the bet made last week by Dutch chipmaker NXP Semiconductors NV, which agreed to acquire Texas-based Freescale Semiconductor Ltd. for $11.8 billion, signaling that it will pitch its products to automakers as the most secure and reliable in the business. The acquisition was about more than cars. 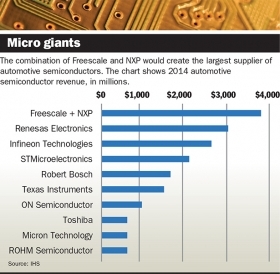 NXP drew 20 percent of its revenue from its automotive unit in 2014, compared with 45 percent for Freescale. But with more than $3 billion in combined automotive revenue last year, the new silicon giant would instantly leapfrog Japan's Renesas and Germany's Infineon to become the largest supplier of semiconductors to the auto industry. "Clearly, this is a merger of scale to try and become a powerhouse," Mark Boyadjis, a senior analyst at IHS Automotive, said in an interview. "These companies were strong as they were, but neither one of them was No. 1 all by themselves." Basic semiconductors are used throughout the automobile, for hundreds of simple electronic tasks such as operating the window switch or regulating the fuel mix. But increasingly, microprocessor power is determining the pace of next-generation automotive development as car companies cram vehicles with image-rich infotainment systems and connect them to the Internet to deliver streaming music, real-time navigation and voice-based assistance features. The most sophisticated vehicles also are scanning the road for hazards and, in some cases, taking over control of the pedals and steering. Such tasks demand more powerful, more versatile processors, which has attracted a new wave of semiconductor suppliers with expertise from personal computers to the auto industry -- among them, Intel and Nvidia. But the challenge for the chip industry is to provide the kind of computing power that these next-gen vehicles need while still meeting the tough durability standards of the auto industry. Just as switching to lightweight steel or aluminum may make a car quicker but less sturdy in a crash, semiconductors from consumer electronics often lack the reliability and security of automotive-grade silicon, said Matt Johnson, general manager of Freescale's automotive microcontroller unit, in an interview before the acquisition was announced. "You can't simply take a consumer product and test it more or try to make it safer after the fact," Johnson said. At a mobile computing conference this month in Barcelona, Spain, Freescale revealed an automotive chip called S32V234 that is intended for use in automated-driving features. Johnson said Freescale's chip, which will be available this summer, is secure and reliable enough that car companies can move beyond "driver-assist" features, which require the driver to be in control at all times. "You don't want to have to make a choice," he said, referring to the challenge facing car companies. "Do I want to be safe but not have the performance I need, or have the performance I need but not be safe?" Chris Webber, a U.K.-based analyst at the consultancy Strategy Analytics, said NXP and Freescale have different but complementary skills. Freescale derives 65 percent of its automotive revenue from selling processors, with a specialty in microcontrollers for safety-critical areas of the car such as powertrains, chassis and driver-assistance systems. Webber said Freescale and NXP's combined strengths will make it "a formidable competitor" for today's contracts and will position the company well for new business as cars take greater responsibility for driving themselves. Rick Clemmer, the CEO of NXP, said in an interview last week on CNBC that it will take years for NXP to realize the benefits of that strategy because of the lag time between winning a contract and supplying the first cars. "You go out a few years," he said during the interview, "and it's an opportunity to significantly improve revenue."